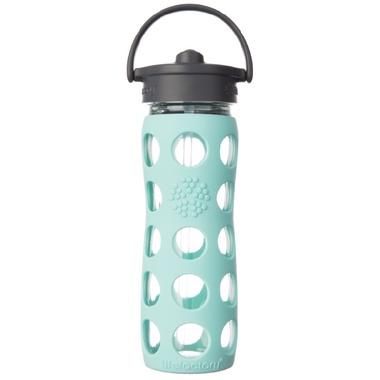 Lifefactory Glass Bottle with Lilac Straw Cap and Silicone Sleeve is designed for upright, spill-proof sipping (no tipping required). The Straw Cap is perfect for the treadmill and yoga class. The pivoting handle provides a great way to carry the bottle and stows out of the way while drinking. I like the bottle, the silicone is a cute colour, easy to clean, and doesn't leak. I use this as my office bottle so I can't speak about it's durability because it sits on a desk all day. The only thing I don't like about it is the annoying squeaking noise the straw/spout makes when I drink, I feel like I can't drink water in a meeting without drawing attention to myself, and it annoys me every time I take a sip of water. My 2 year old son uses this bottle instead of a sippy cup. He drops it a lot and has even thrown it at times and it hasn't broke. I love this bottle , it's super easy to clean and isn't too heavy. This bottle is the perfect size for towing around - fits in my car cup holder, my purse and the handle helps make it very probable. The straw doesn't leak and it seals perfectly when closed. Love this water bottle. I've been switching all our plastic bottles and containers to glass. It's light weight considering it's a glass bottle & fits in my cup holder in my Honda Odyssey. Will be purchasing smaller ones for each of my kids. Really like this water bottle! I am getting more :) It's easy to clean, is sturdy, and the straw makes it easy to drink out of. Love it! Got this as a gift for my mum. She loves the bottle. One of her favourite things: the bottle is shaped well to form to your hand. Very good quality. Glass is the way to go. I love all lifefactory products, we have 6 different bottles in total! Yhe water actually taste what water should taste, love the colour, i like thw straw cap too! I just wish they sell the replacement bottles for all the sizes too.